Step 1 Saute the ground beef until thoroughly cooked, about 5 minutes. Using a fine mesh strainer, drain the beef of all juices and oils. Step 2 Place a medium saute pan over high heat. Add the grapeseed oil. Saute the water chestnuts until crisp, 2 minutes. Add the beef, sweet chile sauce, soy sauce and kechap manis. Mix until the sauces are incorporated. Cook about 1 minute. Add the mint and cilantro, mixing well. Step 3Transfer the mixture to a 4-ounce bowl and garnish with the green onions. Place the bowl onto a larger plate (the restaurant uses an 8-inch-square one). Surround the bowl with the lettuce leaves. Serve with a spoon for scooping the filling into the leaves. In Recipes-list.com we have selected the most viewed recipes from category - Appetizers Healthy eating . Enjoy the best recipes specially selected for you! 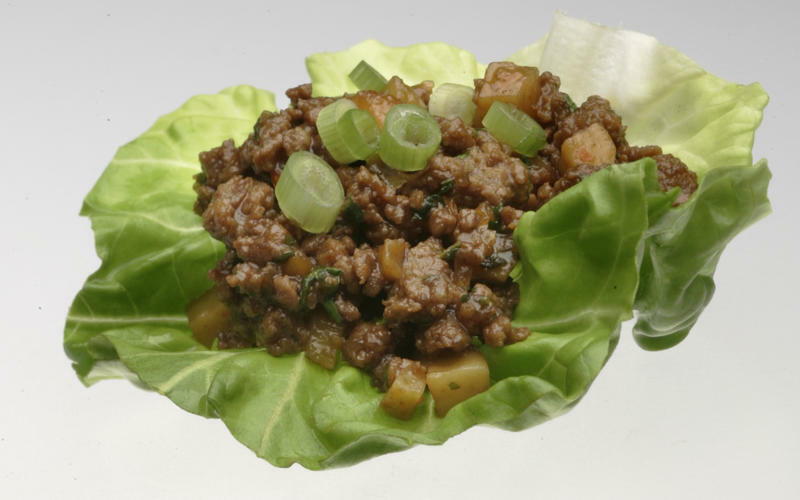 Beef lettuce wraps is the right choice that will satisfy all your claims.